Who paid for your Christmas? Or more accurately, what? For many people a credit card goes beyond mere convenience. If it weren’t for plastic, there would be little to celebrate on Christmas morning. But maybe that’s the way it should be. The availability of quick credit makes it easy to lose sight of reality. What’s the real meaning of Christmas? Is it so bad if children do not receive everything on their wish list? Is it that embarrassing if the neighbors have a few more lights in their yard? 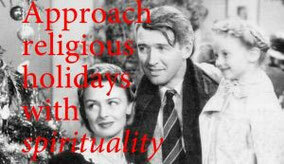 Too many people try to live up to a version of Christmas that would make a Madison Avenue Madman proud. They peruse Martha Stewart to create tableaus worthy of a Hallmark card and adhere to family traditions reminiscent of a Hallmark channel movie. At least that covers one end of the spectrum. At the other end are petty, interpersonal dramas (the less pleasant half of those Christmas movies that make them interesting), which become even more stressful in light of the great expense (psychic or monetary or both) incurred trying to achieve holiday perfection. It’s tempting to harken back to a simpler time. O Henry explained the true spirit of Christmas in his story of a wife who sold her beautiful hair to acquire a watch fob for her husband, while the husband simultaneously sold his prized pocket watch to buy ornate combs (i.e., fancy barrettes) for his wife’s hair. Children—and many adults—today cannot conceive such sacrifices. Modern gift giving is largely removed from sentiment, in favor of a gift’s popularity, brand or cost. Ditto ostentatious light displays. Anyone who gets sucked into the neighborhood competition can soon find themselves spending much more than anticipated. Which brings us back to the original question. What portion of holiday generosity is due to family circumstances, and what portion will be paid to a credit card company at 29% interest? Keep in mind, remittances hovering around the minimum payment will serve as a reminder of that generosity for many Christmases to come. Or, put another way, the payments may well last longer than a child’s memory of the gift. The alternative? Expensive gifts are not an entitlement. And children can handle a bit of disappointment. Better yet, don’t feed unrealistic expectations; wishing is fun, but not all wishes come true. Certainly there is pressure to give children gifts they want. But at some point—when a wish list has been elevated to a list of demands—it is no longer a gift. The quality of any relationship should not be reduced to dollars and cents. The real Christmas spirit is represented in gifts lovingly selected to have special meaning for the recipient, not out of obligation to a list. It is not easy to curb the irrational exuberance that typically accompanies Christmas. So, throughout the season, keep reminding yourself that the spirit of Christmas is in your heart, not in some small piece of plastic.